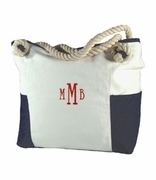 Monogram canvas weekender duffle bag. 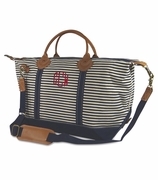 The ladies version of a travel bag in a classy duffel. Horizontal and wide to easily accommodate all your travel necessities. Bold bright colors set the mood for a weekend adventure away from home and this bag makes the perfect choice. It is spacious and durable canvas, ideal to hold all your belongings. Pack it full and zip it up. The bright royal contrasting color straps on a neutral body adds an extra fashionable dimension. Carry it by hand or over your shoulder using the adjustable shoulder strap. Optionally remove the shoulder strap if needed. Interior zip pocket for your mobile phone, car keys or small change. Summery pin stripe soft blue and white lining. 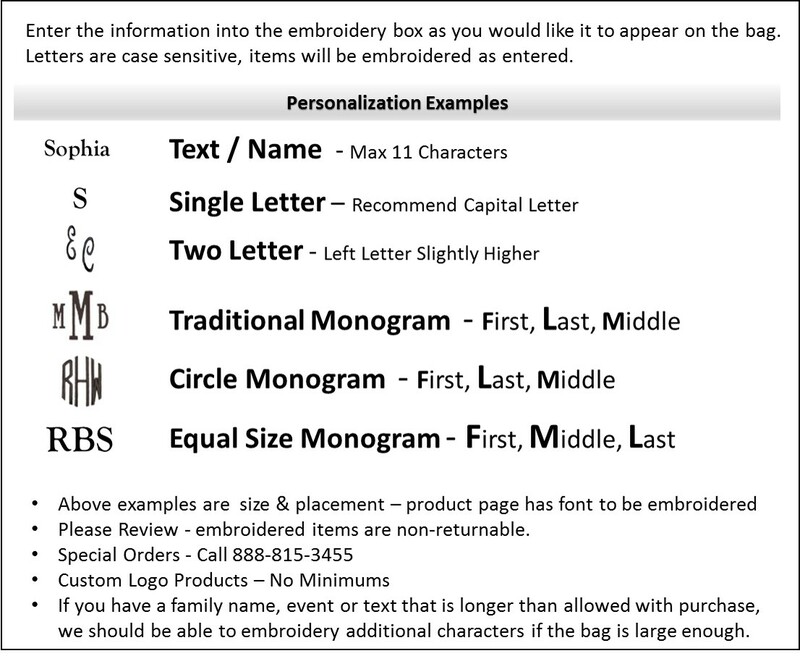 NOTE... DUE TO THE INSIDE ZIPPER POCKET THE FONT WILL ONLY BE 1.25 INCHES IN HEIGHT. Canvas duffel bag measures 24"W x 12"H x 9"H.